This is not your normal rental cottage, the decor has a special flair throughout. Colour galore. Our unique BEACH COTTAGE sleeps 4 (with 3 beds). Our other property, our SEA VIEW COTTAGE (please see property #10068530) sleeps 5 (with 3 beds + a sleep sofa). Both rentals have two bedrooms, a bathroom with shower, a kitchen & living/dining room, plus separate terraces equipped for al fresco dining and sunbathing. Rent both for a large family or a group of friends, or rent separately. Amenities include a dishwasher, a washing machine, iron+board for guest's use, a small library, TV with built-in radio and DVD player and free Internet. The master bedroom has a queen bed and the second bedroom has a standard single bunk bed (2). The bathroom is fully tiled and has a large shower. The property has both air-conditioning/heating. Choose between hypo-allergenic and/or down bedding. Bath and beach towels are provided. The kitchen overlooks the sea and the outdoor patio has dining for 6+ and a BBQ. Its private terrace overlooks the exotic gardens containing tropical plants and original artwork. The cottage has panoramic views of the sea from every vantage point. 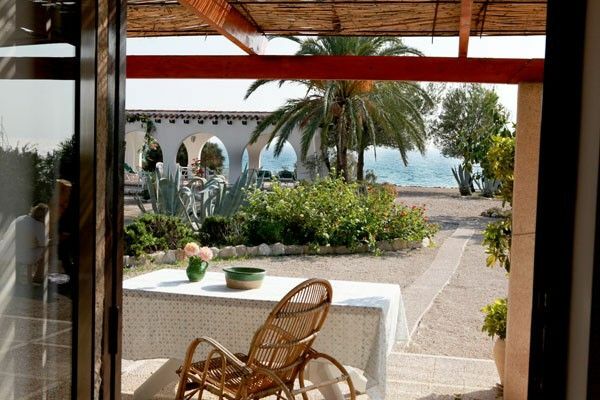 Both cottages are set in a tropical garden with glorious sea views and a pergola-covered patio perched over the Mediterranean sea where you can while away hours and truly relax. The sea laps at the pebbly beach on secluded El Charco Cove to which we have private access, where we snorkel and swim. A Moorish lookout tower is at the tip of our cove. Good trekking options start from the cove, lead to adjacent villages with magnificent Mediterranean views. There's good fossil hunting along local trails that wind through Moorish terraced agricultural lands where artichokes and almonds used to be cultivated. The skyline of Alicante, 25 kilometres south on the coast, is visible from the property. The cultural town of Altea, once the haunt of Picasso and Miró, is approximately 20 kilometres north. You can fly to Alicante or take the AVE (bullet) train from Madrid which takes 2.5 hours. If you are here for any length of time, Valencia is a wonderful destination, only 1.5 hours away by car. Betsy is tri-lingual thanks to her Norwegian father, American mother and having lived in Spain since she was 2. Betsy studied and worked abroad for 8 years in places far and wide, including Madrid, Oslo, London, Aix-en-Provence and Boston before she settled at Charco in 2001. This place is unique. It is absolutely one of the last untouched enclaves along the Costa Blanca coast. We accept pets and kids. 50€ Pet Fee. The property is fenced. Free parking. Private direct access to the beach (just 60 metres away and pet friendly). You won't believe how nice it is here. Bring your kayak, your mountain bike or just your hiking shoes to take advantage of the region. Don't forget your water shoes for the rocky beach. toilet, shower, Large tiled shower. Baby bath available for small children. - Bathroom towels as well as beach towels are provided. - Hair dryer available upon request! 4-ring electric hob. Only microwave, no oven! 50€ pet fee. El Charco Beach is pet friendly! Nos hemos quedado impresionados por la magia de este lugar, su belleza y tranquilidad. El día siguiente a nuestra llegada, nos levantamos al amanecer y quedamos impactados al escuchar los sonidos de la naturaleza que envuelven la casa de Betsy. Olas, grillos, pájaros, ya estaban formando la maravillosa orquesta que nos ha acompañado durante estos días. La playa frente a la casa te permite disfrutar en cualquier momento de un baño en una preciosa cala. Un lugar para descansar y desconectar, de los que ya son difíciles de encontrar. Respecto al alojamiento y las atenciones de Betsy, le damos un 10 en todos los aspectos. Absolutamente recomendable. Sehr schönes Haus, direkt am Meer, tolle Aussicht, super sauber und schön eingerichtet. Das Grundstück ist eingezäunt und zum Strand sind es nur wenige Meter. Die Besitzerin ist ein Schatz. Wir kommen auf jeden Fall wieder. Flott cottage i skjønne omgivelser. To deilige uker i nydelige omgivelser. Flott hytte med fantastisk uteområde. havutsikt og en liten trapp ned til strand. Kort bilavstand til sentrum. Nydelige turområder fra hytta. Et sted for rekreasjon og familietid. Familievennlig. Hadde med tvillinger på 3 som storkoste seg. Serviceminded og kjempe hyggelige vertskap!! What a fantastic location and with very comfortable cottages overlooking a very artistic designed garden and beach. Betsy and her sister Liz were so kind and nothing was too much trouble. The property was clean, cosy and had everything we could need, which made it easy to just enjoy ourselves. The garden is stunning with incredible views of the sea. We spent most of our time eating, reading and sunbathing at the end of the garden just watching the sun glisten on the water. There's a private pathway down to the pebble beach which is perfect for swimming. The old town has some beautiful buildings, plenty of restaurants and supermarkets are close by but we found ourselves enchanted by the fantastic views so spent most of our time at the cottage. Betsy was warm and friendly from her first email and was a delight to meet in person. She was the perfect host, leaving us to our own devices but happy to help if we needed anything. We're already planning our return visit. This was our first foreign holiday with our children (aged 3 and 5) so we wanted to be sure of somewhere suitable and Beach Cottage was recommended by friends who had stayed there with their young daughter. We couldn't have chosen better accommodation! The cottage itself is beautifully furnished and very well equipped, with lovely touches such as fresh flowers in each room. And the setting is really spectacular - a gorgeous garden, safely enclosed so perfect for the kids to explore, with a gate at the bottom to the beach. Who could ask for more! Betsy was the perfect hostess, so welcoming and helpful. We hope to be back. Our cottage is a 20 minute drive away from Alicante, a 5 minute drive to golden sandy beaches in El Campello or the ancient fishing town of Villajoyosa with its Thursday outdoor market, bodegas, restaurants of all cuisines as well as supermarkets for everyday needs. The Costa Blanca offers a variety of water and mountain sports. The lively resort of Benidorm is 10 minutes away. Charco Cove, protected by magnificent cliffs that frame the deep blue Mediterranean sea, provides an idyllic location for the ultimate relaxing holiday in either or both of our two charming cottages (properties 445481 and 10068530). Set in a lush tropical garden the cottages share private access to the beach and are havens of peace and tranquility. Al fresco dining on private terraces or in the shady pergola at the edge of the gardens offer unparalleled views of Charco Cove and its Moorish Tower. Amenities include flatscreen TV with built-in radio and DVD player, there's a satellite dish, WiFi and a dishwasher!